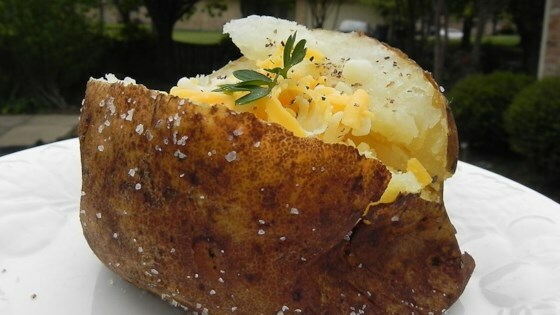 "This baked potato has a crisp, golden skin, and is light and fluffy on the inside. Great comfort food!" Amazing bakers with crisp, golden skin and light, fluffy insides. For a treat, try slicing the very top of the potato off rather than slicing it in two, forming a 'lid'. Scoop out the fluffy contents of the potato, keeping the skin intact. Mix the potato in a bowl with butter, grated cheese and black pepper, then spoon the mixture back into the skin. Replace the lid and serve. 45 minutes at 400 degrees F. 60 minutes at 350 degrees F. 90 minutes at 325 degrees F.